Colour: Ranges in plummage colours from very dark to light brown. Habitat: Preferred habitat - open grassland and agricultural areas. Brown Falcons are small to medium-sized birds of prey (raptors). The female is larger than the male. 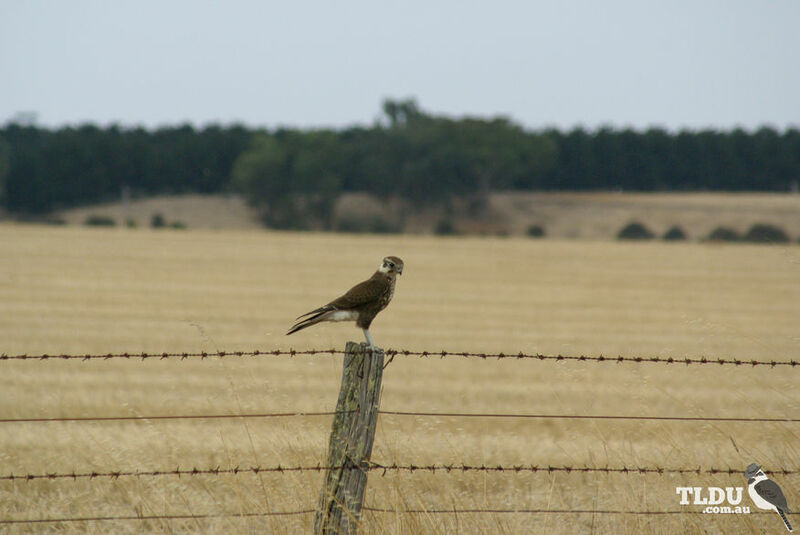 The Brown Falcon has a range of plumage colours, from very dark brown to light brown above and off-white below. Generally, the upperparts are dark brown and the underparts are pale buff or cream. The sides of the head are brown with a characteristic tear-stripe below the eye. Birds from the tropical north are very dark, with a paler face and undertail, while those from central Australia are paler all over. Younger birds resemble dark adults, but have less obvious barring on the tail, and a buff-yellow colour on the face, throat and nape of the neck. Paler birds may often be confused with the Nankeen Kestrel, which is quite a bit smaller and has a more rufous crown. Dark Brown Falcons may be mistaken for the slightly larger Black Falcon. The Black Falcon has longer legs and lacks barring on the tail. The Black Falcon also appears sleeker in shape and movements. The Brown Falcon ranges throughout Australia. The Brown Falcon is found in all but the densest forests and is common throughout its range. Their preferred habitat is open grassland and agricultural areas, with scattered trees or structures such as telegraph poles which it uses for perching. 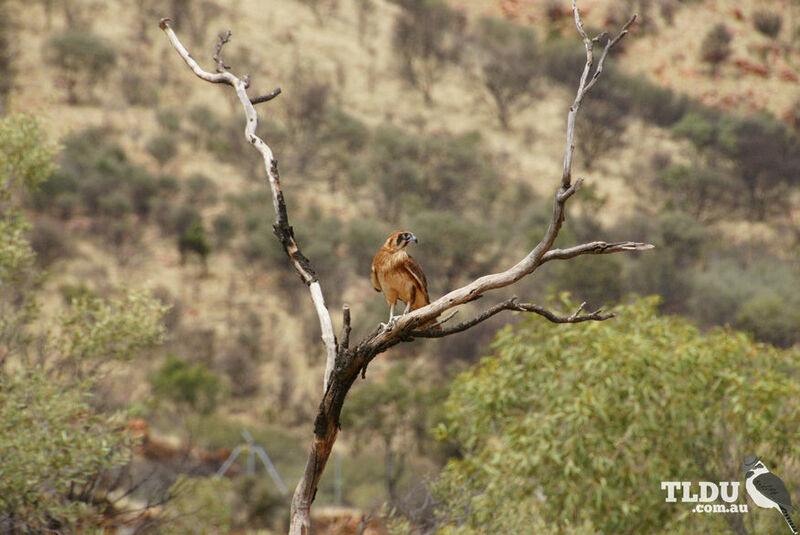 Around outback towns, the birds can become quite tame and will allow a quite, close approach. Birds may stay within the same areas throughout the year or may move around locally in response to changes in conditions. Brown Falcons are usually seen alone, searching for food from an exposed perch. When prey is sighted, the bird swoops down and grasps it in its claws (talons), killing the prey with a bite to the spine. The powerful bill has specialised 'tomial' teeth and matching notches for this purpose. Less often the Brown Falcons will hunt by hovering or gliding over the ground, often at great heights. Brown Falcons feed on small mammals, insects, reptiles and less often, small birds. The nest used by the Brown Falcon is normally an old nest from another hawk species, but the species may build its own stick nest in a tree. Occasionally birds nest in open tree hollows. Both sexes share the incubation of the eggs, and both care for the young, although the female performs the bulk of these duties, while the male supplies most of the food.